Twin soft-shell Flour tortillas filled with sliced, “flame-grilled” Southwest seasoned Shoulder Tenderloin Steak laid over Chipotle Cream Cheese, shredded Cabbage, Pico de Gallo ‘n Pepper Jack Cheese; topped with sweet Caramelized Onions, fresh sliced Avocado, crumbled Mexican Cotija cheese and served with Black Beans and Sour Cream. Twin Flour tortillas filled with crunchy “flash-fried” Shrimp seasoned with Southwest spices, along with Chipotle Cream Cheese, shredded Cabbage and topped with a chunky Habanero-Mango ‘n Red Pepper Salsa and crumble Cotija Cheese… served with Spanish Rice. Twin soft-shelled Flour Tortillas filled with “crunchy crusted” filets of Cod, shredded Cabbage and topped with a chunky Habanero-Mango ‘n Red Pepper Salsa, a swirl of Smokey Chipotle Aioli and crumbled Cotija cheese ; served with creamy cole slaw. 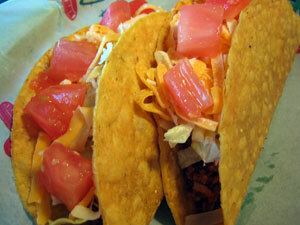 MAKE ANY FULL ORDER OF TACOS A MEAL with Spanish Rice and Black Beans for just $4.00 more. Cornmeal Masa wrapped around seasoned Shredded Pork steamed in a Corn Husk and topped with our Traditional Red Sauce; served with fresh Pico de Gallo and Sour Cream.